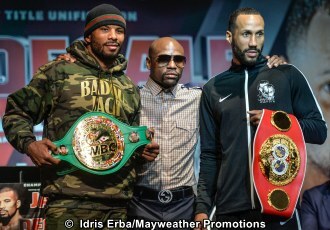 BROOKLYN (January 12, 2017) - Super middleweight champions Badou Jack and James DeGale went face-to-face Thursday at the final press conference before their world title unification showdown that headlines action this Saturday, January 14 from Barclays Center in Brooklyn and live on SHOWTIME. Mayweather Promotions President Floyd Mayweather discussed the highly anticipated matchup featuring his fighter, Jack, who he has helped go from contender to the top of the 168-pound division. Televised coverage begins at 9:30 p.m. ET/6:30 p.m. PT with junior lightweight world champion Jose Pedraza taking on undefeated contender Gervonta Davis, both of whom were on hand to speak to media at the Highline Ballroom in Manhattan.